It is good to know what types of sugars are out there, hidden or obvious, so that you will know what you are consuming. as a nation. Other important sources include cookies, cakes, pastries, and similar treats like ice cream, frozen yogurt and candy, even ready to eat cereals. like trying to decipher a code. It is good to know what types of sugars are out there, hidden or obvious, so that you will know what you are consuming. • Simple sugars: These are dextrose, fructose and glucose. The difference in these sugars is how you metabolize them. Glucose and dextrose are essentially the same. used in American soft drinks and many other foods and beverages. • Sugar alcohols: Seen as glycerol, sorbitol, mannitol and xylitol. These are not really sugars or alcohols. They are being used as sweeteners but are difficult to digest, causing diarrhea, and bloating. • Agave syrup: This sugar is not really a natural sweetener as advertised. It is highly processed and is about 8 percent fructose which is fruit sugar. • Honey: is about 53 percent fructose but is completely natural in its raw state and has many health benefits when used in moderation. • Stevia: Branded as Truvia is a highly sweet herb derived from the Stevia Plant. Stevia is safe in its natural form. Remember that Truvia has gone through processing. in table sugar, so your body doesn’t have to break it down. Therefore, the fructose is absorbed immediately, going straight to the liver and burdening it with extra work. fact, it has been shown to have the same effect as alcohol since they both take the same pathways during metabolism. It is also one of the primary causes for the increase in fatty liver disease over the same time span as the increase in the obesity epidemic. Coincidence? Not likely. And don’t fool yourself into thinking that liver damage caused by fructose consumption is only for those who are overweight. A 2013 study found that liver damage could occur even without excess calories or weight gain. It is important to note here that fructose is the sugar found in fruits and vegetables and is not the culprit. The positive effects of the phytonutrients, antioxidants and vitamins and minerals help to moderate the negative metabolic effects. 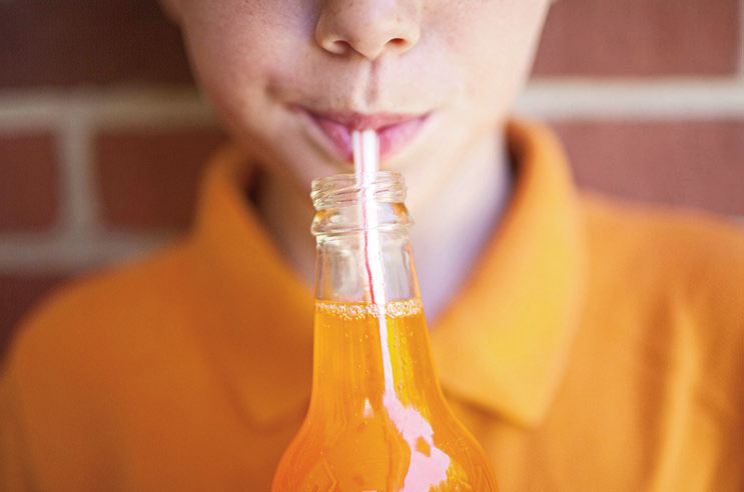 It is the process of turning fructose into high fructose corn syrup that creates this unhealthy form of sugar. published in February of this year in JAMA that states a sugar- laden diet raises your risk of heart disease even if you are not overweight. There is also very strong evidence that supports the connection between chronic inflammation and cancer, not to mention those cancers that are linked with high BMI and obesity. A 2013 study revealed that high fructose corn syrup in the intestine triggered the formation of a hormone called GIP that is controlled by a protein that is completely dependent on sugar. This hormone increases insulin released by the pancreas. AS CONCERNED CONSUMERS AND PARENTS WHAT CAN WE DO? 1. Give up the soda! End of story. Sugarfree beverages are not a good alternative because the artificial sweeteners used in manufacturing come with their own health problems. They are laden with empty calories that can easily add unwanted pounds. Twenty ounces of soda has 16 ½ teaspoons on average and about 250 calories of sugar in the form of high fructose corn syrup. That translates to the amount of calories in ½ pound of body fat at the end of one week. In two words: Drink water. more calories per ounce as regular soda. breakfast. Read labels and look for the sugar content. Remember you should have less than 40 grams daily. 4. Watch for hidden sugars in foods. Tomato sauce, ketchup, drink mixers, tonic water, marinades, peanut butter and fatfree dressings. In fact many fat-free foods are filled with sugar. 5. Learn what to look for on a label and read them! Ingredients like dextrose, maltose that end in “ose” are sugars. Lactose, which is milk sugar, does not have the same detrimental effect. 6. Satisfy your sweet tooth with fresh whole fruits. Remember fruits are a natural, whole food. Though they are fructose-based carbohydrate foods, they are beneficial because of the abundance of nutritional benefits we get from their antioxidants, vitamins, minerals and fiber. Three to four servings daily are recommended. Mercola, J. “Fructose: Feeds cancer, triggers weight gain and promotes premature aging”. April, 2010, Web. Kirkpatrick, K. “10 things you don’t Know about sugar (And what you don’t know could hurt you)”. August, 2014, Web Corlis, J. “Eating too much added sugar increases the risk of dying of heart disease”. February, 2014, Web. Barbara Mintz, MS, RD, Vice President of Healthy Living and Community Engagement for Barnabas Health, New Jersey.